Not in my area, but I worked with this awesome crew on the PCT this weekend installing timbers to mitigate runoff in the big burn area. It was hot, dirty work but the crew held up well. 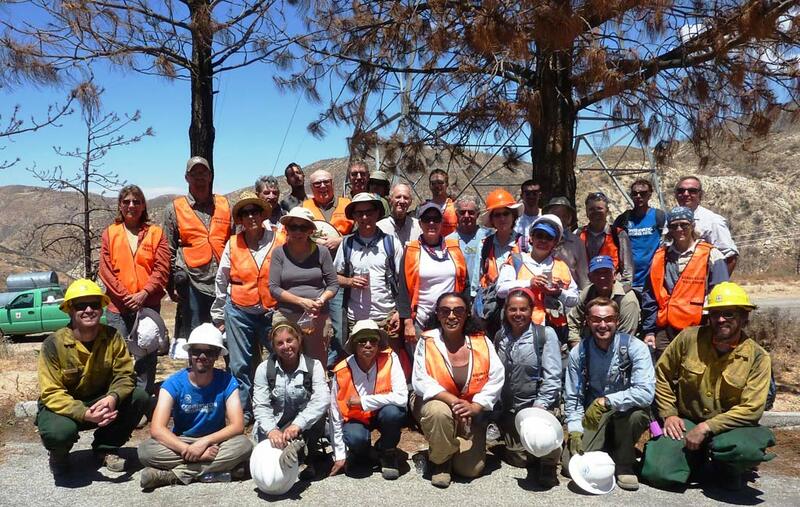 Pictured here are PCTA, Sierra Club, San Gabriel Trailbuilders, High Desert Runners, and Student Conservation Association members, along with Forest Service workers. 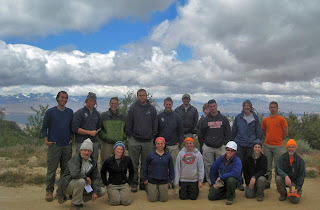 Some of these same SCA kids worked with us in May in Section E.
I posted John Hachey's latest Region 1 newsletter here. We have an awesome team of volunteers (over a dozen, I think) for the work project this Saturday! I'll see some of you out there. 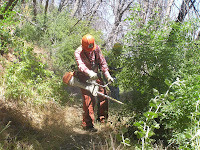 We'll clear heavy brush on the north slope of Liebre Mtn, where the trail descends to Pine Canyon Road. We'll start work roughly a mile above the road and work up toward Horse Camp. 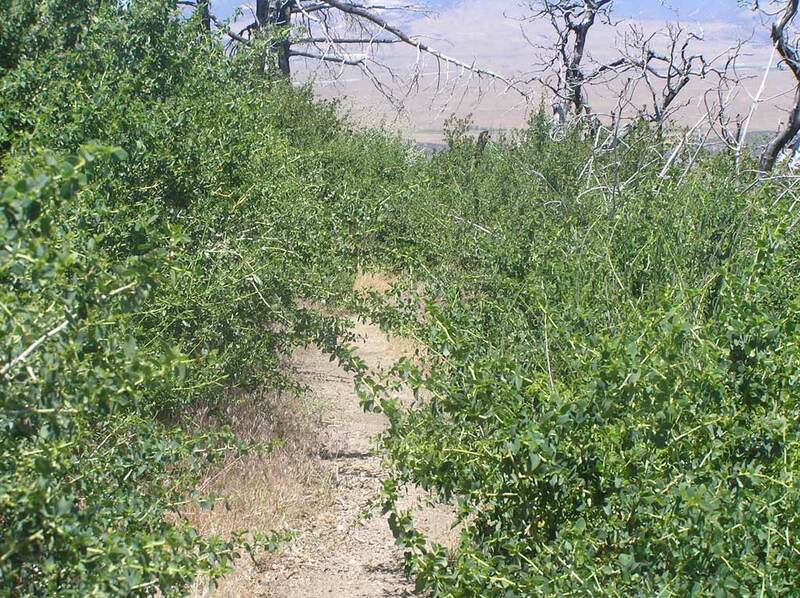 As we’re working, we may meet thruhikers on the trail as they hike northbound on the PCT. PCTA will supply all equipment and tools. Volunteers should bring a sack lunch, minimum 2 qts water, leather work gloves, robust footwear, sun protection, and wear long-sleeve clothing. Volunteers should meet at the pullout at 0745am on June 19. The pullout is on the south side of the road, right at a hilltop on Pine Canyon Road. By placing your home address in the 'A' field, Google can determine the shortest driving time & distance for you. If interested in volunteering, please respond to me directly at hikevv@gmail.com. What a great weekend! Volunteers from the PCTA, Troop 146 of Quartz Hill, the Antelope Valley Group of the Sierra Club, and several others joined two Student Conservation Association crews and USFS reps to work in mile 498 above the Atmore Meadows Road crossing. We worked two days, and though it was a cold overnight campout, somehow we avoided getting snowed on. But the Tehachapi range to the north didn't avoid snowfall, as seen in the photo. BIG THANKS to all the outstanding volunteers we had for this work project, including James the cook, who made our tasty and very filling meals. Sign Up For Automatic Update Messages! Reminder to all, that you can sign up for email updates here. Then whenever I post to this blog, you'll receive a notification of the update. Dave and I inventoried from Liebre Mtn summit southbound to Atmore Meadows Road, and took waypoints on blowdowns across the trail. Pete and Jerry are getting those, and for the segment above Atmore Meadows Road, we're calling all volunteers for a May 22-23 work party. For Saturday, Sunday, or both. We'll camp Saturday night, and Sunday will be a shorter workday. A backpacker has informed us of several blowdowns between Mile 500 and Horse Camp. 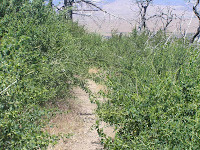 Look for info here soon for a possible work project to clear the trail. On another note, The Herd of 2010 thruhikers is now starting out from San Diego County, and traffic in Section E peaks the last week of May through the first week of June. Water situation this year is pretty good, partly because our area got another winter storm last week. 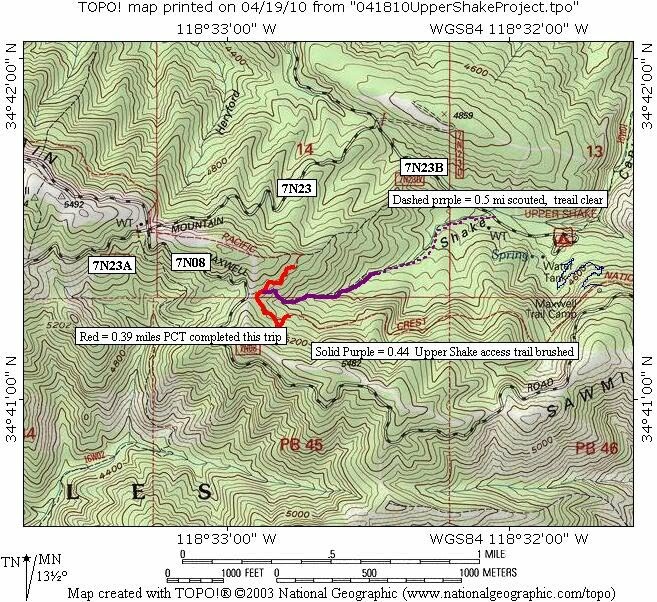 We had an awesome volunteer army of 14 out this weekend to work trail in the area of Upper Shake CG in Section E. Here's a map of what we worked. We also received word that more trees are across the trail at Horse Camp. Look for an announcement here when we get that project scheduled. Volunteers will be out brushing and treading on April 18 in the area of Upper Shake CG. If you want to come out and help get the trail in shape for spring, contact me (hikevv@gmail.com) and be ready to meet HERE, at the intersection of Pine Canyon Rd and FR 7N23 at 07:30. We'll finish 2:30 at the latest. If you have a higher-clearance vehicle, please bring it. If you don't have one, we'll try to recombine vehicles as needed at the meetup location. Volunteers should bring leather work gloves, a lunch, water, and sun protection. Long pants and shirtsleeves are a must. 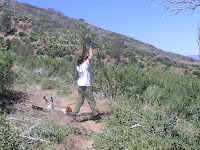 Pacific Crest Trail Association will provide tools. We already have a small crew of about 6 volunteers lined up, so I know this will be a successful day. 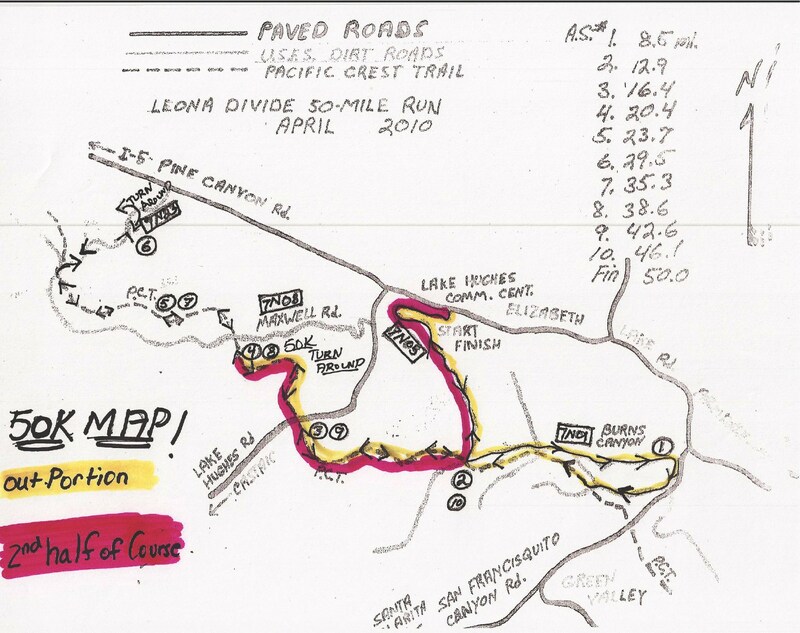 The Leona Divide 50 mile foot race will be held on the PCT on April 17. 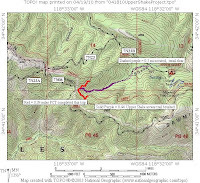 Here's a map of their course in Section E.
Users can assist the thruhikers by offering updates to the online Water Report. The spur trail leading up from Upper Shake CG is clogged with brush according to reports, Dave and I are looking at dates to go work it back. Will post that info here when we have it. If anyone hikes up Liebre Mtn in the near future I'd appreciate hearing precise info on blowdowns in that area. Usually every spring we need to go in and cut them out. I updated the calendar with John's latest. I stopped to inspect the culverts that Dave Fleischman and crew installed in 2007 behind the sag pond. They were fine but I saw some blowdowns, which makes me wonder how hard these recent storms might have been on the trees up higher. For now, if anyone heads out to hike in my stretch of the PCT, I'd appreciate hearing whatever specifics you can offer about blowdowns or washouts.